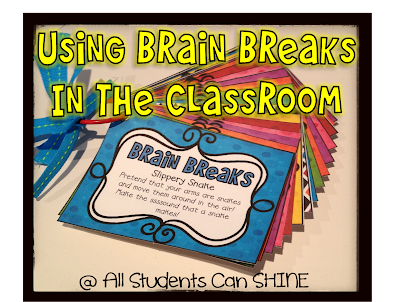 In my classroom, I use brain breaks. There is a FREEBIE in the preview file! What do you do to keep your students on task? 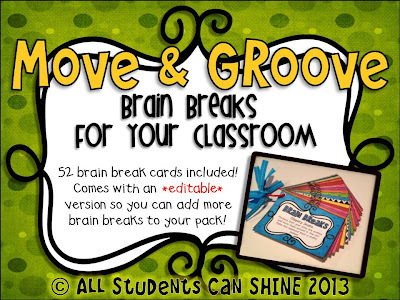 Leave me a comment and I will choose one person who will win my new Move & Groove - Brain Breaks For Your Classroom Pack! Thank you! Love that red ring you have to hold the cards together. Super cute! 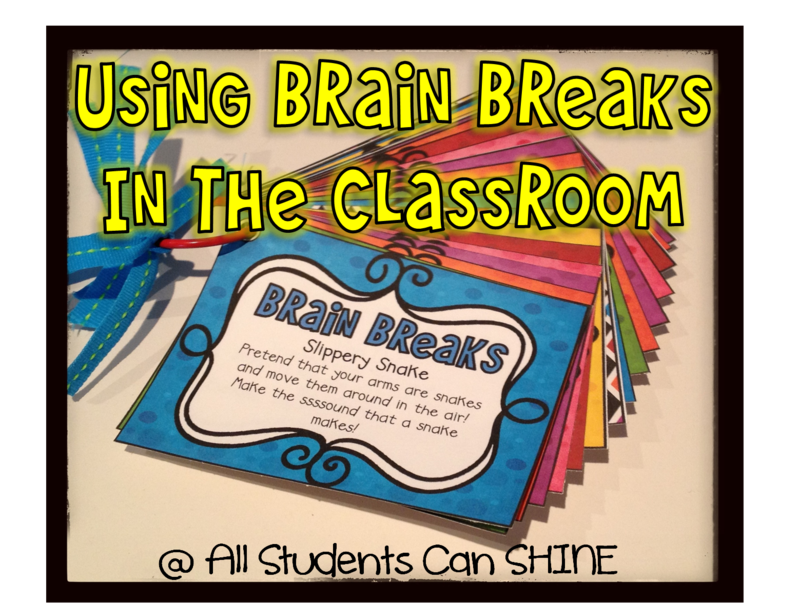 Brain Breaks rock...they always bring a smile to everyone's face! I teach middle school and the kids get antsy before the end of class so I have been using something I call "Shake, Rattle, and Roll." The kids stand up and shake their arms and legs, rattle their bodies and roll their shoulders. It's just enough to get the blood flowing again but not enough to get them off task! Love the idea of doing different things! I teach grade 2 here in Oz and towards the end of the year we would 'Gangam style' for a few minutes with the kids singing the song and dancing. They loved it and since they were all mad about the song and dance it got a little of it out of their system! I love the idea of having a bunch of these on a ring to pull out and use. Thank you! These look great! I am looking to add more movement throughout my day and these look great! They look great!! My 2nd graders love moving in between lessons. Their favourite is follow the leader. love this idea. always looking for ways to help the kids move a little!! These look great! I can't seem to find the preview button though. Can you help? We break out and do the Cha Cha slide and now we are starting to "twerk" thanks to my dancing teenage daughter! You should see my firsties pop their booties!!!! 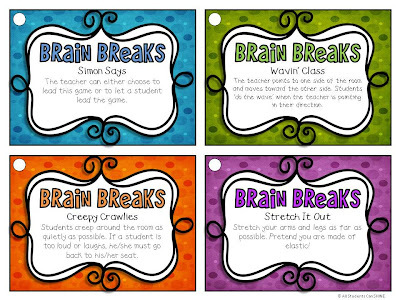 I help my students stay on task by building in brain/body breaks...Yogie Yoga is one of our favorties! I kept losing my list of brain break exercises so my husband and I made an app with them. (I always have my iPhone with me.) I'm still so excited that I helped make an app! Check it out. It's called Minute Moves. Wow this looks so awesome I am a teachers aide for a very large kindergarten class. We are always trying to get the kiddos to focus and nothing seems to work. These cards would be so great!!! How can I order a pack for the Teacher to have in her classroom? I love this Idea! 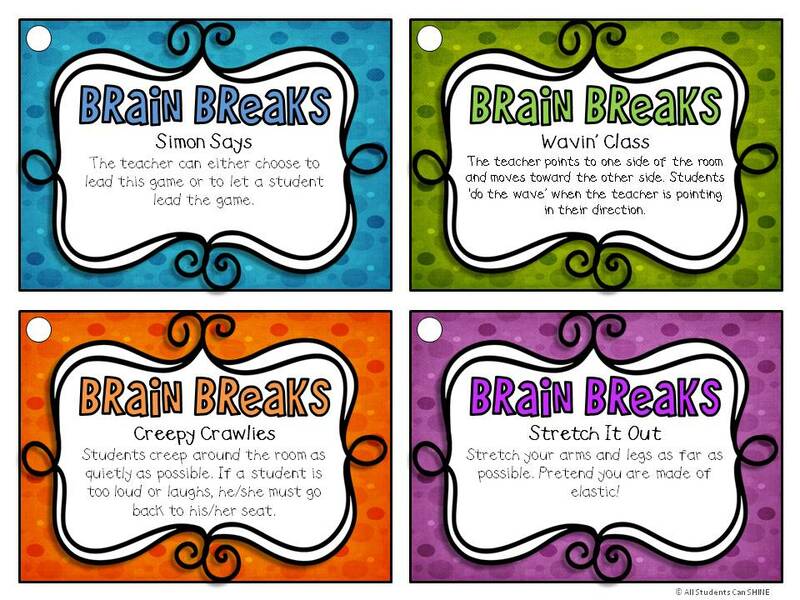 I am getting ready to start student teaching and these would be very helpful! Great ideas indeed! Very helpful! I would just like to ask what ages you teach and how long each of your lessons lasts. Thanks! 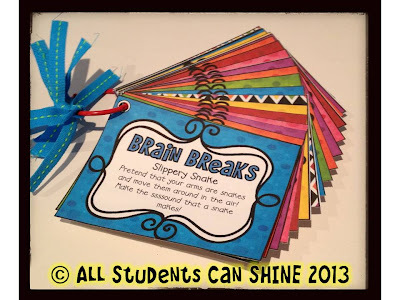 Congratulations on your brain breaks! It's a great idea to have a variety of them at hand! When we need a break we usually play 5-minutes activities such as "I spy with my little eye something..", "Find someone who...", "How many things can you think of that...(are small enough to fit into a pocket)", "Write down words beginning with... (a give a letter) in 2 minutes!" "Can we all together get 20 or 30 words? ", "The last letter word", "Change chairs if you are...(wearing blue trainers)", "Make a wave with your arms", and things like these.